Amy Firth is an Australian singer and songwriter living in London. Raised west of Sydney in the cloud cloaked villages of the Blue Mountains, her sound is rooted in the wood smoke and eucalypt of an Australian winter. Undercurrent is proud to be releasing her latest EP ‘Watchmaker’s Daughter,’ available now on Bandcamp. UC: What was your inspiration for the title ‘Watchmaker’s Daughter? AF: It’s from the opening lyrics of ‘Hope & Time & Love’ which came about because I AM in fact the daughter of a watchmaker! My Dad has been teaching watchmaking for 27 years and he is the only full time teacher of watchmaking left in Australia – a lone soldier in an ongoing analog Vs digital battle that has spanned the last three decades and seen the industry ebb and flow. Growing up, our house was always filled with clocks and watches bonging and chiming at all hours of the day – it became a running joke to any visitor that despite each wall hosting a different clock – none of them actually told the right time. Ultimately the album is a nod to my family, it is anchored in the love and strength I gain from them. UC: Is there a story behind the songs? AF: Yes and no. Some just flopped out – ‘All The Blues’ came to life all by itself just by playing around on the loop pedal. ‘Hope & Time & Love’ emerged fully formed once I started experimenting with open D tuning. ‘New Heart’ has more clearly defined roots and reaches back to a time when my friends and I charged naked into the North Sea off the tip of northern Scotland on the strike of midnight on New Years Eve – we believed/hoped our naked surrender to the (FREEZING) ocean would reward us with a new heart. It remains to be one of the most exhilarating and ridiculous things I’ve ever done… but four years on – I think we all agree something changed for each of us that night. UC: Can you share anything about your process as a songwriter? AF: I don’t think I’m able to really pin point or explain my ‘process’ – more often than not it feels like something is driving me rather than me driving it. But I do know that it’s the simple and mindful acts that allow the juicy and powerful stuff to come to the surface. I always feel more connected to life when I’m diligent with writing daily, exercising, meditating and getting healthy amounts of sleep. In terms of the music side of things – I think it’s about giving yourself the space and time to experiment. Ultimately I learn by simply keeping on keeping on. Watching and listening to music that inspires me. Jamming with friends who know more than I do. Challenging myself to lean into the areas that seem awkward or slightly bonkers. UC: Are there any major influences on your work that you know of? AF: I love love love the Australian folk scene. When I first started performing solo I was living off an audio diet of The Waifs and Something for Kate. I think that’s how I ended up singing with such a strong Aussie accent. There is something so powerfully Australian in their music – the tone and warmth of it, it hooks into me and makes me want to write. Like many solo female singer/songwriters Ani DiFranco is my absolute hero – her passion and prose continues to astound me. And although it’s not particularly reflected in my sound, I really connect with the strength and power of Etta James. She stirs the fire in my belly. UC: How does being an Australian in London influence your work? AF: It was an odd choice to leave Sydney when I did, but ultimately I thrived on the freedom that came with the anonymity of living in a BIG city like London. Those clean slate opportunities happen so rarely. As I’ve grown more comfortable in London over the last five years, that energy has softened somewhat and now it’s more about privilege and gratitude. What a blessing to live in London and be able to share my music with people all over the world! Living away from my family & friends back home is getting harder each day and more complicated to justify, but ultimately they become a source of strength and a driving force to make the most of it, make it count, make them proud. UC: What inspires you most in your life? AF: The people I love. UC: What do you think is the role of art in our society? AF: Ultimately I think our role is to tell tales. It’s such a primal way for humans to connect, come together – share some food, play some music, share our stories. It sounds so simple but that is where the magic happens. People come alive in these moments because they’re being seen, they’re being heard, they’re in the moment and feel a part of something. The music I love empowers me because it makes me feel more connected and less alone. This is what I strive for with my music and ultimately what continues to blow me away the most – the more and more I lean into the stark, bald truth of it all – the more it seems to resonate with people. This fills me with absolute hope. UC: What are the greatest challenges for you as an artist? AF: The inner critic. The doubts. The fears. The battle with worthiness – ‘who do I think I am getting up there expecting people to listen? !’ It can be a relentless rabbit hole of shame. Or it can be a springboard into awesomeness. This was something I struggled with for a long time, but the turning point for me came through enormous loss and grief where I ultimately found gratitude in its purest form. This “Aha!” moment developed into my greatest passion: The Vulnerability Project, where I explore the tipping point where vulnerability drives momentum in the creative process. Many people assume vulnerability is weakness, when really it’s our greatest strength. UC: Anything else you want to say? AF: Such a huge thank you to everyone who have helped me share this album. Like so much music out there, this is an independent release relying on word of mouth and kind souls sharing it around so if you do enjoy the tunes please pass it on. Support unsigned music. Support independent arts makers. More often than not that’s where the magic happens because it’s real, it’s hard fought for and it’s telling our story. 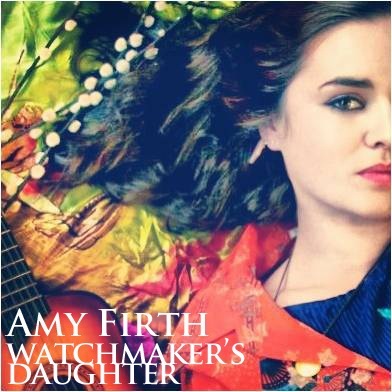 Amy Firth’s EP ‘Watchmaker’s Daughter’ is out now on Undercurrent Records, and also features a collaboration with fellow UC artist Annalie Wilson, who plays keys on Amy’s song ‘Wonderland.’ For more about Amy visit www.amyfirth.com.